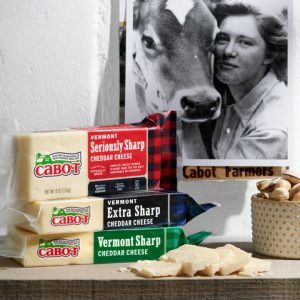 CABOT, Vt.— The farm families who own Cabot Creamery Co-operative are celebrating their Centennial in style with new packaging for their award-winning cheeses. The new modern-rustic feel for Cabot’s signature plaid honors the co-op’s proud past while looking to the future. During extensive research, customers loved the new design and agreed it makes Cabot cheeses stand out on store shelves while staying true to the brand’s rich heritage and the enduring passion of the farmers who own the co-op. Cabot is owned by the dairy farm families of Agri-Mark, the Northeast’s premier dairy cooperative. And since the very beginning, all profits have gone back to support those farm family owners. What started in a single butter plant in the small town of Cabot, Vermont in 1919, is now enjoyed by customers in all 50 states and over twenty countries around the world. “A century of quality is truly something to celebrate, and with their new packaging, the farmers are ready for the next hundred years,” continued Townley. Cabot’s award-winning legacy continues to grow, as shown in the results of the 2019 US Championship Cheese Contest where, among many other awards, they took home gold medals for Extra Sharp Cheddar, Medium Cheddar and unsalted butter. Cabot Creamery Co-operative has been in continuous operation in Vermont since 1919, and makes a full line of cheeses, Greek yogurt, sour cream, cottage cheese and butter. Widely known as makers of “The World’s Best Cheddar,” Cabot is owned by the 800 dairy farm families of Agri-Mark, the Northeast’s premier dairy cooperative, with farms located throughout New England and upstate New York. For more information, visit: cabotcheese.coop.